I'm re-doing all my flute videos specifically to suit the chapters of my flute book (at which I am still hard at work---very time consuming.) I have a better camera, and better general videos for all teachers and students to study. This takes time, of course. Just recently I decided to remove 80% of my youtube flute teaching videos from Fluteloophost channel, but then, due to a flurry of emails,(Sept. 9th 09) I was asked to put them back up on youtube again. 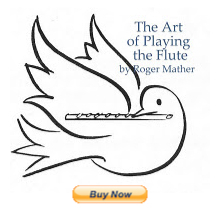 But let me again assert that these older youtube flute videos (prior to 2009) are aimed at very specific questions from flute teachers, and very specific flute student queries. So they aren't "one size fits all". I was confounded by some of the comments they generated from absolute beginners who were trying to do my "advanced intermediate embouchure excercises". I had specifically said on some of the videos: "These are not exercises for beginners" but I guess some people comment without actually taking that fact in. But do please enjoy some fun summer videos that I made for my many gardening neighbours to laugh at: Here's episode three of "In the Garden"
And, the gardening videos were really simply to help the gardeners who were away on holiday have a record of what gardening was being done prior to their return. I look forward to watching your new videos. I was one of these absolute beginners who watched and ised your "intermediate flute student videos"
Well, for me, it absolutely worked! In my VERY first WEEK of flute playing I was trying hard to get a tone out of the instrument that sounded like flute; instead, I got something that sounded like whisperung with a sore throat! Then I watched your videos "Teaching tone" and "Emboucure flexibility" and was immedeately able to PLAY on that flute. These five videos "Teaching tone" and "Embouchure flexibility" actuelly really taught me more than my teacher in the six months I took flue lessons and I was able to play autodidactically afterwards. (I am not aiming at concerts and such, just pop tune and popular classical tunes in the first two octaves for which my flute playing level absolutely suffices). So YES you can and DID help absolute beginners enormously with these videos, please don't stop them :-).